Having the right pan for steak can be the difference between a lackluster slab of beef and a juicy, flavorful delicacy that’s been seared to perfection. Steaks are definitely one of the few foods where technique can only get you so far. When it comes to putting the finishing touches on a marbled masterpiece, you’ll definitely want to have the right tool for the job. So what is the right tool? 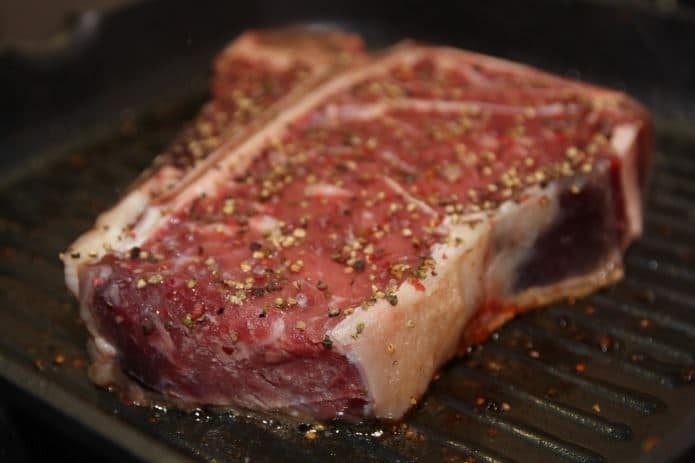 Let’s dive in to some of my favorite products for cooking steaks at home on a normal, consumer oven range and explore some of the more out-there options that I’ve encountered over the years. By the end of this guide, you’ll be an expert on all of the cookware you can use to make a perfect pan-seared steak. When evaluating how well a pan can handle a steak, I like to look for two very important properties. Number one, the pan should be capable of handling high temperatures on the range. This is vital for producing a proper sear. When you’re cooking a steak, you want to get your pan as hot as you can. This means that any sort of non-stick coating that wimps out at 350 F is a no-go. Number two, you want a pan that’s oven safe. 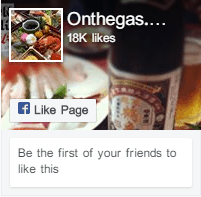 There’s one interesting caveat here – you don’t want this to be the same pan. 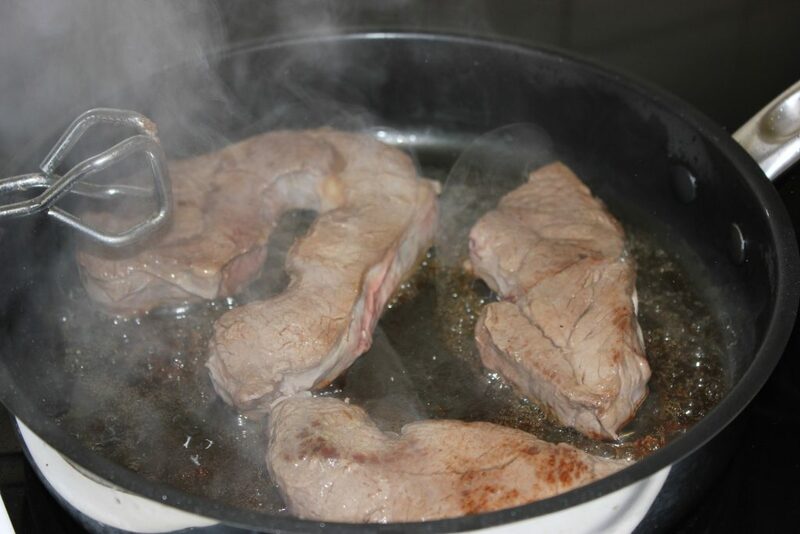 Starting a steak on the stove and then moving it to the oven might sound like a perfect task for an oven safe pan, but bear in mind that your pan will retain some amount of the tremendous heat you applied when you were searing it. The reverse holds true for starting a steak in the oven and then throwing it on the stove. If you use the same pan, you’ll have to wait for your pan to preheat properly on your range. This often takes a minute or two, and you definitely don’t want your steak to be slowly cooking from one side while you wait for your pan to reach proper searing temperature. You could remove the steaks from the pan while you wait for it to cool off or warm up, but in both cases I find that it’s much better to simply have two pans. Besides, your oven temperature will be quite mild, so you can usually use a non-stick or ceramic pan (or even a pot) for the oven part and a stainless steel or cast iron pan for the searing part. So what pans would I recommend, specifically? Here are a few of my favorite pieces of cookware that are available right now for reasonable prices. Cast iron pans have a big advantage when it comes to high temperatures. While they’re not necessarily complex in terms of construction, the iron in the pan is very good at retaining heat. A cast iron pan doesn’t heat up very fast, but once it heats up, it stays hot for a long time. As far as steaks are concerned, the thing you’re concerned about here is max temperature. A cast iron pan has no problems getting so hot it glows. You don’t need to sear every steak at this hot of a temperature, but it’s nice to know that your pan can handle the heat with no problems at all. So why this cast iron pan in particular? Three reasons: it’s pre-seasoned, it’s reliable, and it’s cheap. The most important factor for novice cast-iron users is the first one. 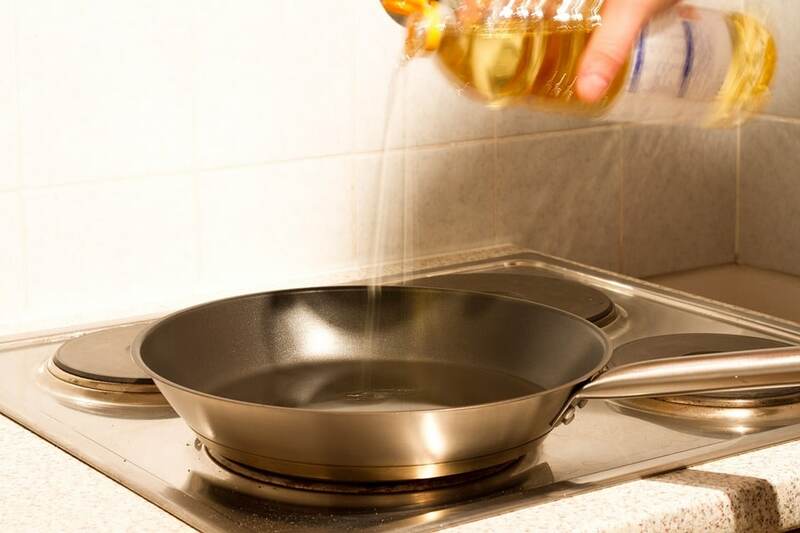 Seasoning refers to a complicated process that involves applying cooking oil to your pan and then heating it up several times. When the process is done, you’ll have a pan that’s somewhat non-stick under normal cooking conditions. Since this pan is pre-seasoned, you can skip this process entirely. You’ll naturally maintain the seasoning over time whenever you cook with fat in the pan. Of course, you’re free to get rid of the default seasoning and do it yourself if you so desire – or if you accidentally wash the pan with soap. Because the seasoning on your pan is essentially a layer of special, cooked on fat, soap pretty much dissolves it on contact. This means that you’ll need to re-season your pan if your housemates or guests decide to “help” by washing it. Re-seasoning is definitely not a giant deal, but it is somewhat confusing for beginners and can be time consuming. This Lodge cast-iron skillet is extraordinarily reliable. For one, it’s a thick hunk of durable metal. 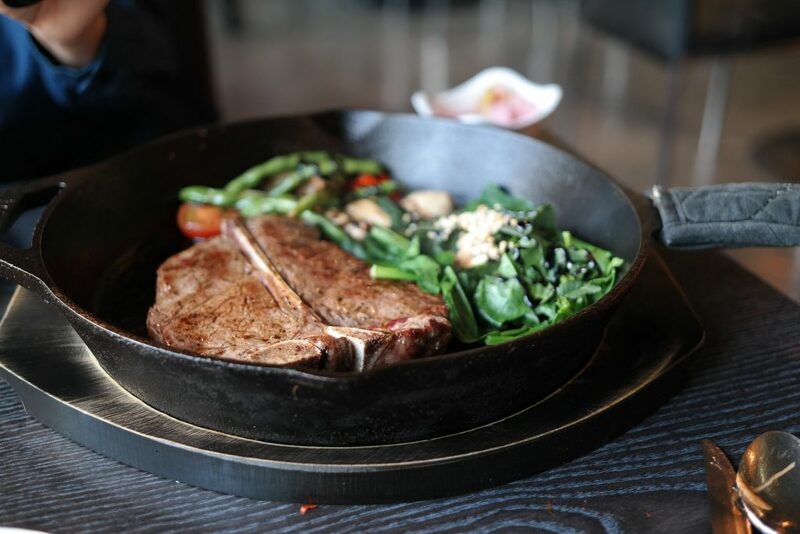 It’s also one of the most popular cast iron pans on the market, and Lodge has done an excellent job when it comes to quality assurance and customer care. This might not be the cast iron pan your grandmother used, but it may very well wind up being the one you give to your grandkids. Used properly (and stored properly), there’s no reason it can’t last for many decades. Cast iron has become a bit of a cookware trend in recent years. As a result, many high-end brands try to sell you cast iron pans for pretty ridiculous prices. Don’t pay them. 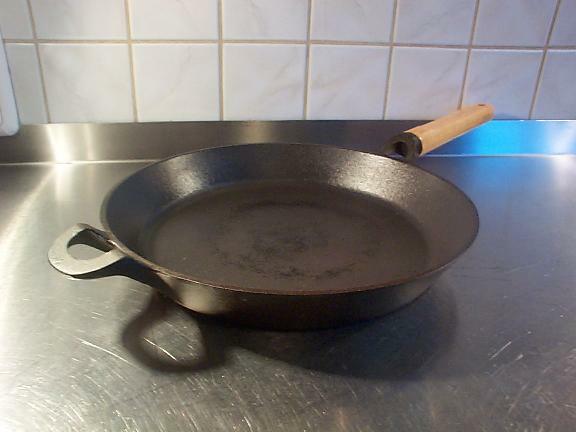 Cast iron pans are quite similar, whether they’re made by All-Clad or Target. You’re essentially paying for a shaped hunk of solid metal. While there’s some workmanship involved, you really shouldn’t be paying much more than the cost of this Lodge for any cast iron frying pan you pick up. There are some disadvantages when it comes to cast iron. The most obvious one is that they’re pretty terrible for normal cooking. Fans of cast iron will tell you that they’re amazing for absolutely everything, which might not line up with your experience. In my kitchen, cast iron pans are okay for controlled low temperature cooking, great for holding things in the oven, and incredible for high temperature cooking. I find that cast iron’s ability to retain heat gets in the way of me adjusting my cooking temperature if I’m cooking anything that requires me to touch the burner controls. My cast iron pans also heat up much more slowly than my stainless steel ones, meaning cooking things on medium heat can take a fair bit longer. 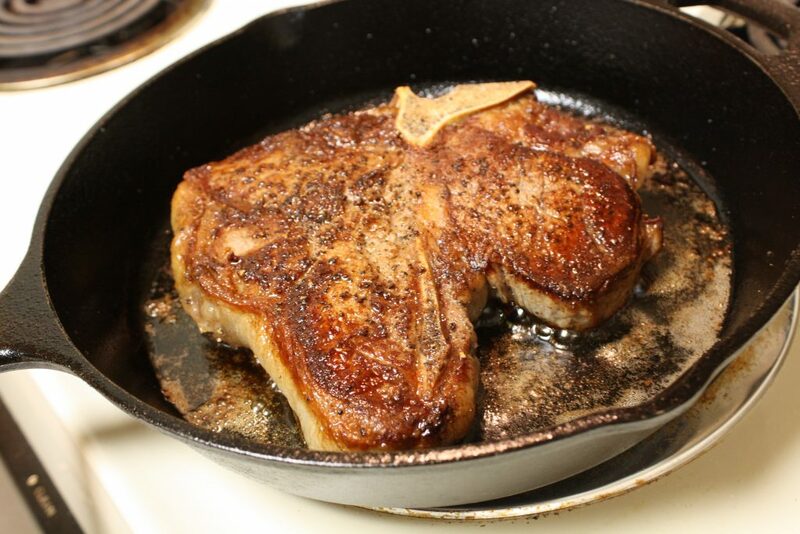 Overall, this Lodge pan is a cheap, reliable option that’s brilliant for searing steaks. As far as having a high-temperature heating surface, there are only two things that will beat this: a rack just above the flame on your grill, and a cookie sheet and a blowtorch. If you want the best option for cooking steak in a frying pan, this Lodge cast iron pan is a solid choice. 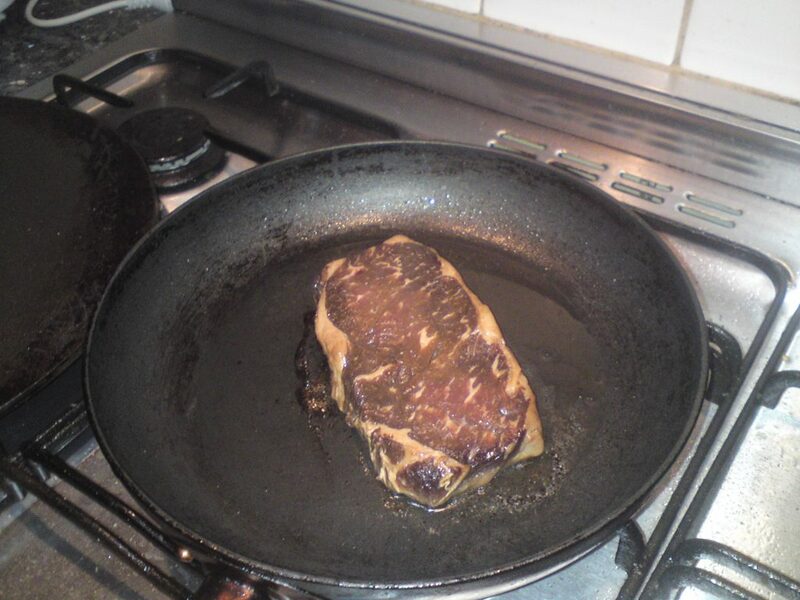 Can You Cook A Steak In A Stainless Steel Pan? Cooking steak in a stainless steel pan is admittedly somewhat suboptimal. While stainless steel can handle high heat pretty well, it’s top-end temperature tolerance lags behind cast iron somewhat, especially when you get a tri-ply pan like this one. If you leave it on your stove with the heat up as high as it will go, you might find that you wind up with some heat damage that might even be permanent. You can scrape off some amount of cosmetic damage with a stiff brush, sure, but you’ll probably want to stick to more moderate searing temperatures in a stainless steel pan to avoid having to go through the trouble. Pan cooked steak isn’t the only thing this pan is good for, however. While you might not want to get this pan quite as hot, I find it much more useable for cooking pretty much everything other than steak. It’s my go-to for stir-fries, other meat (like chicken, burgers, and more), vegetables, sauces, and pretty much anything else that doesn’t need a lid. If you do want a lid, check out this pan, which is quite similar in many ways but gives you a bit of added versatility when it comes to cooking with steam or boiling liquids. The reason for this has to do with the materials used in tri-ply pans like these. Cast iron has a lot of thermal weight, meaning it heats up slowly and then stays hot. Stainless steel, by contrast, heats up quicker and stays hot for less time. Aluminum heats up even faster. It’s one of the best metals as far as conducting heat goes. This pan uses a layer of aluminum sandwiched between two layers of steel to allow heat to freely flow throughout the whole pan, preventing any hotspots and helping the whole thing heat up very fast. This also means it cools down fast, which is important if you want to start off a dish by toasting some peppers over high heat and then reduce things to a simmer to let flavors blend together. Like the cast iron pan above, this Cuisinart pan offers a great blend of price, performance, and durability. It’s an all-metal tool that won’t need to be replaced under normal use conditions for many years. The stainless steel exterior is practically impervious to damage from metal cooking utensils and it won’t rust unless you do some pretty silly things to it. Even if it is damaged, which takes some doing, you can simply scrub off a little bit of metal and reveal even more stainless steel underneath. The biggest downside to this pan is probably the lack of non-stick properties. There’s no seasoning involved with stainless steel pans, only proper temperature control and plenty of cooking fat. This is something that you’ll have to get used to if you primarily use non-stick cookware. Once you get the hang of it, however, you’ll find that cleaning up after a bout of cooking takes only a few seconds longer than cleaning a non-stick pan. Now, there’s one big question left to answer with this pan, and that’s how much worse the steaks are. Not a lot. 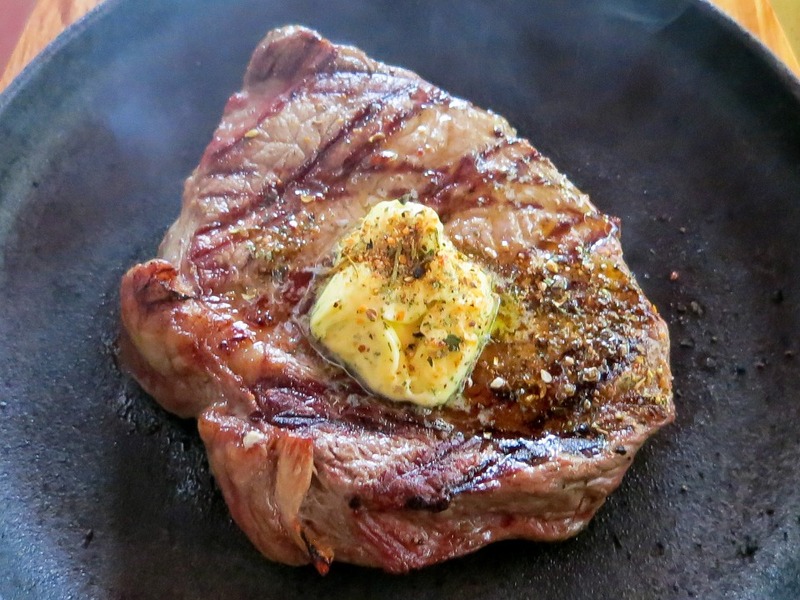 A few degrees of heat during a critical part of the cooking process will certainly impact the exterior of your steak, but it won’t ruin things. If you cook a good cut of meat to the right internal temperature and make a good-faith effort to sear it on a high-temperature cooking surface, it will turn out great. A cast iron pan simply gives you a little bit more of a sizzle and turns things up by a subtle amount. Overall, this is one of my favorite pans to own, period. It’s a smidge worse for steaks due to the lower temperature tolerance, but it’s great for performing other cooking tasks. If I had to choose a single pan between this and the cast iron option above I would absolutely go with this tri-ply Cuisinart pan. The primary advantage of cooking steak on a grill pan is cosmetic. You get grill lines. This is a nice option, for sure, but when I’m cooking pan grilled steaks I’m much more interested in producing a nice, crispy exterior that’s browned to perfection. For me, having an uneven cooking surface makes that task more difficult. The steak might not look as nice to some people, sure, but I’m actually quite partial to having an evenly colored exterior on my steak – it means the whole thing will taste amazing. Now, this isn’t to say that you can’t use a grill pan. It’s just to say that it’s not my preference. I’ve quelled my personal issues with these useful cooking implements by choosing a pan that lets me simply ignore the raised parts of the grill and slap my steaks down on a solid griddle. This Lodge option is multi-purpose, affordably priced, and offers a tremendous number of advantages when it comes to searing steaks. For one, it’s made of solid cast iron. This lets you get it really, really hot. It’s essentially the cast iron pan from above with a different form factor. This means it’s one of the better tools to use for any extremely high-temperature cooking. The second advantage is that this grill pan easily fits over two burners. If you’ve ever wanted to cook a family-sized amount of steaks in a single pan, this is the option to choose. Even a fairly large frying pan can quickly get crowded when you throw a couple of T-bones in there – if they’ll fit at all. This roomy Lodge grill pan has no such issues. Finally, you have the ability to flip this grill pan over and use either side. On one side, you get a flat surface that’s great for cooking eggs, pancakes, and steaks without grill lines. 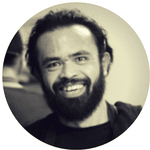 On the other side, you get raised ridges that produce dark areas and change the way your food heats up somewhat. It’s arguably more reminiscent of a traditional grill and it certainly helps funnel fat away from things like burgers in a jiffy. There are a few things about this grill pan that are worth talking about. For one, it doesn’t have a handle, so it’s pretty darn hard to move while it’s hot. This is a common feature among grill pans, of course, but it’s worth noting that some people might find it awkward to use when compared to a conventional pan. The second issue is that it’s cast iron, which means you’ll want to keep it seasoned or be willing to spend some time cleaning it after you use it. Finally, it’s not really a perfect egg or pancake griddle, at least when compared to a conventional multi-ply or aluminum pan, since it takes a while to heat up and making fine temperature adjustments can be difficult. Despite these minor downsides, if you want to cook lots of steaks at once or you want to get grill marks without using your grill, this Lodge grill pan is a perfect option. It’s quite close to the cast iron pan above when it comes to searing steaks on high heat, and it’s got an extra mode of cooking, making it a killer choice for any family that likes the extra cooking surface. These days, reverse searing steaks is all the rage. This is a simple technique that involves two parts: you preheat the heck out of your pan, sear both sides of the steak over very high heat with as little cooking time as you can, and then throw the steak into your slow cooking device of choice until it reaches the internal temperature of your desired doneness. This can be done in the oven on low heat, in a sous vide machine, or even in a smoker. I find that using a frying pan for the first part is ideal, since it’s a great way to quickly sear both sides of your steak without cooking the middle. There are a few other ways to cook a steak, however. The most obvious one is to reverse-sear it in reverse (or normal sear, I suppose): you start by getting the steak to the internal temperature you want in a slow cooking device then throw the steak on the grill (or on a pan) to sear the outside. This technique has the minor disadvantage of cooking the steak a little bit after it’s reached the perfect internal temperature. It’s not a huge deal for most people, but you may find it harder to precisely control the doneness of your steak with this method. The final method I want to cover involves just a frying pan and some patience. 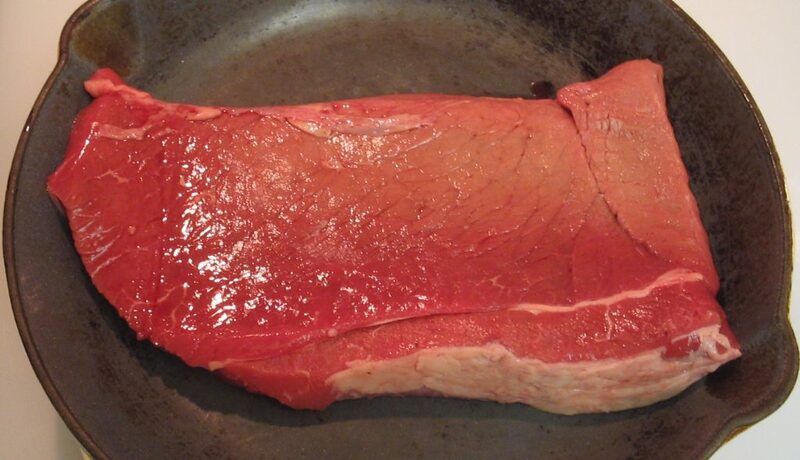 You can cook a steak entirely by simply flipping it over at the appropriate time. This means you’ll have to be careful with both heat and cook time. You’ll definitely want an instant-read thermometer handy if you want to pull your steak off when it’s rare or medium rare. 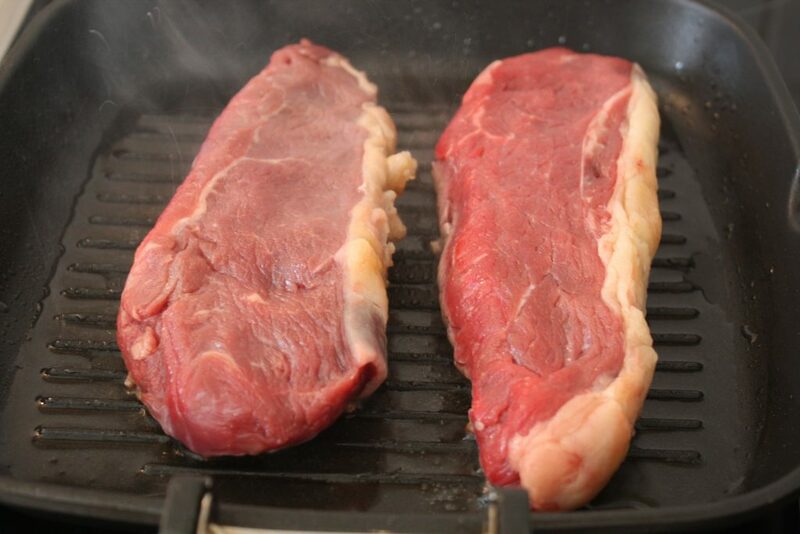 Taste tests suggest that it doesn’t matter how many times you flip your steak as long as it’s cooked evenly. For cheap cuts of meat (or if you prefer your steak well done), the last method is actually perfect. Choose thinner steaks and simply sear the crap out of both sides, ignoring the middle. You won’t get that nice, tasty rare part in the center, sure, but you’ll have two wonderfully seared sides that are seamlessly joined in the center. As far as preparation and fat go, be sure to generously salt your steak before you cook it (ideally about a day in advance, but 30 minutes is enough to make a noticeable difference). Butter has been consistently found to be the best cooking fat in blind taste tests, but feel free to use whatever cooking oil you’d like if you prefer. After all, you’re cooking for you and your guests, not those taste testers! When it comes to steaks, getting the temperature as high as possible is the name of the game. Cast iron pans (especially the above option from Lodge) are some of the best tools in the business, followed closely by tri-ply stainless steel pans. If you want grill marks, consider using a cast iron grill pan. By choosing the right tool, you’ll give yourself a leg up and you’ll have a bit more fun making wonderfully tasty dinners for yourself and your household.